Well, Karagöz really worked hard on acculturating to his new part-time life in America last night. He snuck away from the quiet night that M. and I had at home, through the floorboards, and joined our neighbors in their after-midnight-after-party. It clearly involved a lot of booze. And, of course, last night was New Year‘s Eve, so you know what that means, bubbly. Karagöz had never had anything other than rakı (rah-kuh, which is like ouzo), and had no idea how terrible champagne can be the next day – even compared to rakı. I woke up to him moaning, head in hands, really moaning in pain and considering the choice between Hacivad Bey’s sensible Advil packet and Esma’s herbal tinctures which smelled, well, vile. She’s all for the herbal cures (e.g. a mix of sage, garlic, lemon and tea that she learned from her Annanne or granny). Pretending I know nothing of this from Mercan Bey, who M. cannot sense, I ask M. of his own experience with this elixir. 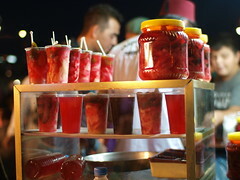 M. tells me that this drink is best known in the Southern part of the country (look near Gaziantep or Adana), that it is a salty and sour and spicy drink that is fermented in wooden barrels. M. says it is totally delicious and that he used to drink it while he was in the army (required for all Turkish young men) in the southern part of the country which tells you something about what he was up to on his days off, I suppose – and who could blame you, if you heard his insane stories about the Turkish military…but writing about these things will likely get us censored, so enough of that. As Mercan Bey handed Karagöz some of the drunkard’s next-day elixir, Karagöz regained some of his impishness, and winked with wicked wit, saying “Can you say “pucker up, anyone?” And all was well with the world as the şalgam suyu went down the gullet. This entry was posted in Cross-cultural learning moments, Turkish Food!, Visits from the Karagöz puppets and tagged Adana, Gaziantep, Karagöz and Hacivat, New England, Ottoman Empire, shalgam, Turkey, Şalgam. Bookmark the permalink. 2 Responses to Karagöz is dying for some Şalgam suyu…what about you? Turkish ‘Mehmetciks’ must be a load of old softies – black turnip juice indeed – we British ‘Tommies’ would talk to god down the great white telephone and get on with stuff. Mutlu Yillar!